Read for This Week's Study: Rev.3:14-21, Heb. 12:7-11, Matt. 25:1-13, Zech.3:1-5, Song of Sol. 5:2-5. Read the following Bible passages (Rev. 3:14-15; 2 Cor. 1:20; John 3:10-11; Col. 1:13-17). Why do you think that Jesus used the titles “the Amen,” “the faithful and true witness,” and “the beginning of the creation of God” to address the Laodicean church? One of Satan’s fatal deceptions is to blind us to the reality of our spiritual needs. Some of the religious leaders of Jesus’ day were blind to their own spiritual poverty. 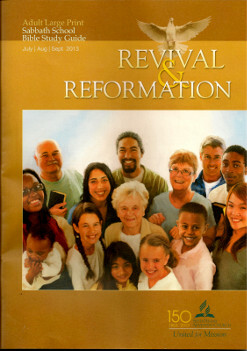 They were Bible-reading, Sabbath-keeping, tithe-paying “church” members looking for the coming of the Messiah. Yet, many were in darkness regarding the type of spiritual kingdom that He would usher in. Jesus called them “blind guides” (Matt. 23:24). Paul writes to the church at Corinth about those “whose minds the god of this age has blinded” (2 Cor. 4:4, NKJV). This is why Jesus said that He came for the “ ‘recovery of sight to the blind’ ” (Luke 4:18, NKJV). Jesus will restore the spiritual eyesight that we have lost if we allow Him. Every time that Jesus opened blind eyes in the New Testament, He was revealing His desire to open the eyes of our minds in order to enable us to see Him clearly. Ellen G. White quotes Revelation 3:20, saying of Jesus, “ ‘I stand at the door, and knock.’ ” Jesus knocks; He doesn’t break down the door and force His way in. What this means is that, in the end, regardless of what God is willing to do for us, we must make the choice to let Him in. Ask yourself, “How resistant am I to opening the door to Him?” If you are resistant, ask yourself, “Why?” What is holding you back? What sin, what indulgence, don’t you want to let go of, or what is it that you find so hard to let go of?